What gives Connecticut workers the heebie-jeebies? We surveyed 100 people from Connecticut to get the answer. As it turns out, this small state has some big fears—but things you might expect, like incompetent bosses and ancient software, didn’t even rank. So what do Connecticuters fear in the workplace? Turns out, it’s all about the Benjamins . . . maybe. More than anything else, Connecticut workers worry about getting adequately compensated for their work. That fear isn’t unique (31 other states list it as their top fear). But is it legitimate? Of course, individual roles will have different salaries, and salaries vary from company to company. An executive assistant from Hartford, CT could absolutely make far less than one from Charleston, WV, so these numbers alone don’t mean Connecticut workers shouldn’t worry about their wages. Let’s go back to those salary numbers: Connecticut’s average salary equates to 120% of the national average salary. But when you consider that Connecticut’s cost of living comes out to just under 120% of the national cost of living, those higher salaries don’t go so far. No wonder Connecticut worries about salary just as much as other states. While Connecticut workers feared low compensation more than anything else, wages were far from the only thing on their minds. Worries of job loss and work overload came close behind. 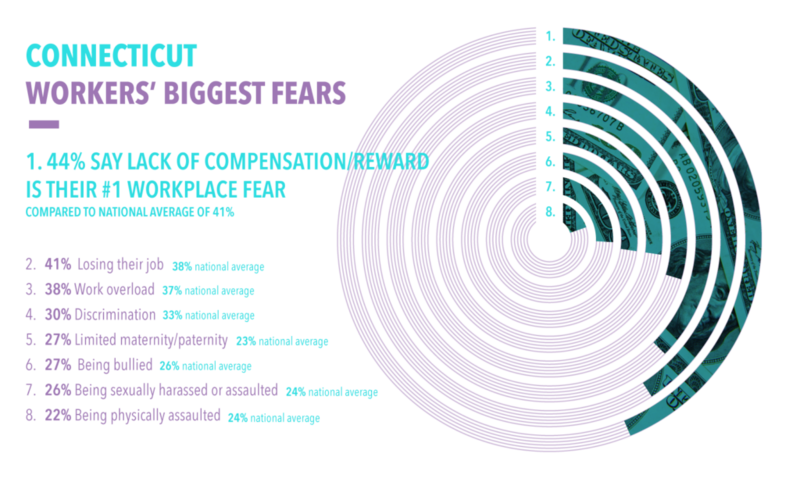 In fact, of the eight fears identified in our study, Connecticuters had higher rates of concern than the nation at large in all but two categories: discrimination and physical assault by coworkers. When asked about all of these workplace fears, 20% of Connecticuters said they’d experienced one or more of these issues in their lifetimes; of those, 51% reported experiencing one or more within the past year. So what’s a worried Connecticut worker to do? If concerns about too-low pay keep you up at night, you can always negotiate your salary. Switching jobs can also provide a big salary boost.6 Plus, a job switch could help you get away from nasty coworkers or difficult workloads, thereby addressing many of Connecticuters’ other workplace fears. However you decide to face your fears in the workplace, remember you’re not alone; plenty of Connecticut workers are right there with you. Hey Connecticuters—do you think these workplace worries are well-founded, or are they baseless fears? Tell us what you think in the comments below! We conducted our study in partnership with Lux. All information was gathered via phone and email surveys. We spoke with 100 people from each state for a total of 5,000 participants. Next Article What Are American Workers’ Biggest Fears?